Tucker’s Collision Center in Las Vegas is conveniently located just off NV-593. In fact, Tucker’s Collision Center in Las Vegas is a 20-minute drive down NV-593 for most Whitney residents. That means you might have already driven farther and paid more for less quality service. But now you know that we are located at 5140 Cameron Street just south of NV-593 in Las Vegas. Don’t risk having your vehicle repaired at an average body shop when an industry leader is within grasp. Vehicle owners in Whitney, Nevada sometimes don’t realize how Tucker’s Collision Center is so close to them. We want to let Whitney residents know that if you own a car, truck, van, crossover, or SUV, Tucker’s Collision Center is within driving distance. Rest assured that we have a team of GM certified professionals ready to take care of your vehicle’s collision repair and body work needs. We would like to take this opportunity to extend our genuine service guarantee to all Whitney residents. At Tucker’s Collision Center, all services are completed quickly and according to the manufacturer’s specifications. If you have a vehicle in need of repair and live in Whitney, it is now time to consider who is the best collision service provider. Make no mistakes about it, we are confident that we are the region’s best collision center because of our high customer satisfaction. If you just realized that you should have been coming to Tucker’s Collision Center all along, it is time to schedule an appointment. 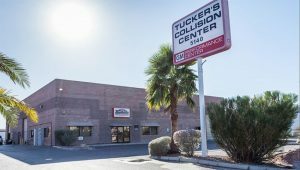 Call Tucker’s Collision Center in Las Vegas to have your vehicle repaired at a world-class facility with GM certified body and paint experts. Tucker’s Collision Center is conveniently located within a 15-minute drive from Whitney, NV.